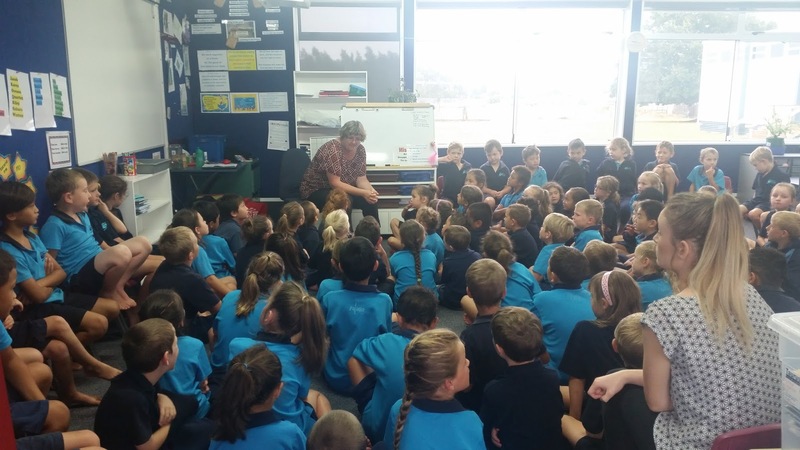 On Friday morning the whole junior syndicate met in Mrs Finucane's Room 7. 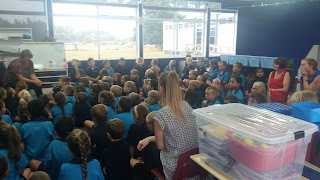 This was a chance for us to greet all of our new smiley faces that have joined the Stanley Avenue whanau. It was also a good time for everyone to meet the teachers in our syndicate and to discuss a few things about what we do at school, our behaviour and expectations of when we are at school too. In other news , Room 5 have their display up in the office foyer! We have been listening to the story of The Crayon box that talked. It is all about a box of crayons who do not get along and do not like each other. Then a little girls bus the packet and makes an awesome picture and the crayons see how awesome each other are, and the great things they can do when they work together. I will put a picture up next week, in the meantime, pop in to the office and see our smiley little crayons on display. This will be up for the month of February. I hope you all had a great first week. We were very busy and the time went so fast! Next week we will be getting into our routine of Reading , Writing and Maths . Homework will also be sent home next week so please keep an eye in your child's notebook for details. We are swimming next week in the afternoons, everyday, so please remember named togs and towels. Enjoy the long weekend with your whanau , I will see you all next week.